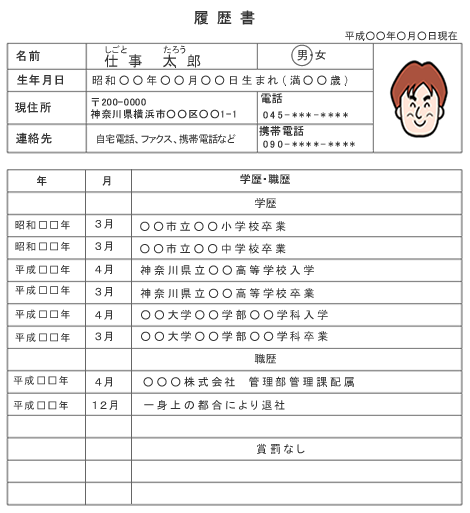 In Japan, there is a standard format for resumes/CVs. 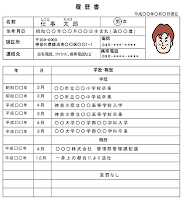 It's called a 履歴書 (rirekisho), and employers outside of the ALT and Eikaiwa arenas often require that applicants prepare a resume in this format. Blank resume forms can be purchased at any convenience store, and often at department stores and grocery stores, too. They shouldn't cost more than 10 or 20 yen per sheet. *Resumes marked JIS are confirmed to follow Japanese Industrial Standards for document format. When you buy a form at a convenience store, it will usually be an A3-size sheet of paper so the whole resume can be contained on one side of one sheet. However, since most people don't stock A3 printer paper at home, we've included files here in which the form is split in half across two A4-size sheets. Most of the resume can stay constant for every job application: Your name, contact information, educational history, and certification aren't going to change. (In Japan, it's common to list all certifications on a resume, even if some of them have nothing to do with the job you're applying for.) But, you need to tailor the 志望動機 (shibou douki - "motivation for applying") and 自己PR (jiko PR - "self introduction & promotion") sections for every job you apply for. These are the things that Japanese employers are reading very carefully to find out whether you really know what kind of work you're applying for and whether you're really interested in the field. Again, traditionally these resumes are supposed to be hand-written: If you get accepted to a job interview, or if you're hired for the job, the employer may ask you to, retrospectively, rewrite your resume by hand and send it in. When they ask this, they aren't necessarily asking you to change the content. Having a handwritten resume on file is just part of "fitting in" with Japanese corporate culture. But this kinda kicked my idea of working in a japanese company. If you really get judged by that paper, I don't have any motivation left working for that company. For me, a resume and application is "a tool" for getting into an interview. It's the personality, motivation and skill that should decide if you fit into an company or not. The resume should give a sneak peek about a person - the rest should be decided after some personal talks. If someone asks me to rewrite my resume by hand just for no real reason - or treat me because of my handwriting - I would probably just stand up and leave, as this is very likely not the company I want to work for the next years for. If you refuse to rewrite your resume by hand, it means you are not eligible to work in Japan, you will even be blamed for coming to Japan by Japanese people not only recuiters, because it is a culture of Japan and you do not respect it all. Even though more of typed rirekisho is accepcted today, hand written rirekisho does not mean old-fashioned. 'Hand writing' is regarded as a way to express your politeness, respect for the others and personality, which are very important in Japan, personal formal letters/cards and its envelope are ususally hand written rather than being typed. Therefor, rirekisho is written by hand in general, and treated as a thing to judge you whether you are worth to invite for an interview or not, not just to see your skills relevant to the work for recruiters. Meanwhile, typed document shows your typing/PC operating skill, so Shokumu-keirekisho is always typed, never hand written. This is not my opinion but general common sence in Japan, because I am Japanese. You did a very nice job, thank you so much ! "This is not my opinion but general common sence in Japan, because I am Japanese." Yeah oooook.... What planet are you from again? I think what you meant to say is that job is for Japanese people only not foreigners. Opinion or not your common sense is out of whack. Try to understand this if you have common sense, we are foreigners looking for a foreigners position not a Japanese not a native position, or we wouldn't even have this discussion, because we would all be Japanese Duhh. I think it would come across as a little childish if you refused, at some point in the application process, to write something out by hand, on principle, when asked to do so by a potential employer. Maybe you have (or will have) tons of job offers in Japan flooding your way, this will never be an issue for you, and you can stick your nose up at Konami or Bandai or Kanebou or LION for asking you to provide a handwritten resume (because they do). (Hell, even the Japan-side hiring process for foreign firms like Goldman Sachs requires it of new grads.) Or maybe you will choose to stay within the ESL industry, in which there are plenty of good career opportunities that often have already modernized their hiring processes to better accommodate foreign perspectives. But I suspect that most bright-faced recent grads with a shot at working for a Japanese company on the Japan side, who are probably the only people who would need to search for these forms on an English-language website anyway, would be willing to comply with such a request. Don't know if anyone still cares, but to the people saying that you need to re-write your japanese resume out by hand....total B.S. I have gotten multiple job offers and multiple jobs in Japan at Japanese companies with a printed resume. To anyone reading this and feeling a little intimidated by the idea of being judged by the writing of a language that is not your own, I'm here to tell you that you need not be. Just print your resume out and submit it. Most employers seem to have enough sense to understand that Japanese is not your native language and thus will not judge you on your writing ability ( unless of course, the job you are applying for specifically requires hand-written Japanese ). They would be more likely to judge you on your Japanese comprehension through verbal communication ( which is thoroughly assessed during the interview ) and Japanese input/reading ability ( for things like daily email sending/receiving). Just because other people have applied to what I can assume are some of the most closed minded companies in Japan and have been rejected for not being born a Japanese native, does not mean that you will. Have hope and send that printed resume out. If they do reject you based on your non-writing, chances are you would not have wanted to work there in the first place. Look at it as them doing you a favor. The guy saying all the that bs along with "because I'm Japanese " is full of dog crap. He's not Japanese. Clearly a weeaboo. Can my wife work while she is applying dependent visa from student visa ?? While she left the high school ?? ?